What's the difference between a good piece of W. German pottery, a really good piece, and a less than good piece? How do I figure the comparative value? Those are tough questions in any collecting field, but they're especially tough in WGP because the variety is so extreme, and many of the pieces are quite unlike what most collectors are used to seeing. Sure, beautiful and ugly are both in the eye of the beholder, but it behooves the beholder to train that eye before trusting its judgment. Like most collectors, I started out as a magpie, grabbing anything bright and shiney and taking it home. That method is lots of fun and means frequent gratification, but it fills the nest rather quickly, and you soon find that too many parts of the collection no longer seem worth the effort it takes to dust them. The thing about "Magpie Collectibles" is that their power doesn't last. If you really spend time with them, the impression starts to fade. That's usually a matter of detail. The line and proportion of the form are off just enough so they may catch the eye but don't really hold the eye. The colors may be striking, but the hue and relationships of colors are simply unusual, not really successful. The decoration may be neat in design but sloppy in execution. The thing is that most people have to buy those Magpies and actually take time to look at them, hold them, think about them, get to know them. If the piece is a little better, you may be able to strike up a pretty good friendship, one that lasts fairly well, even if it doesn't mean you like spending all your time together. These "Acquaintance Collectibles" are like the friend you're happy to bump into, but you don't go out of your way to arrange time together. Over time, you may well like them just as much as before, but they don't grow on you. The depth just isn't there. Then, there are those items that you realize you like more now than you did the first day you saw it on the shelf in the shop. You may even remember that you didn't like it all that much at first, but over time you appreciated how the curve of the handle made you smile, how the line of decoration and colors made you smile even on a bad day. The more time you spend, the more you notice finer points and details. At the very least, you're committed enough to call these "Engagement Collectibles". Sometimes, it may be a "Marriage". In many ways, you're looking for the same qualities in the relationship, things that make it not only possible but usually enjoyable to spend time together daily year after year....then wake up one day and realize you still managed to learn something new. Each level of collectible has its place depending on the type of collector or the collecting stage. Magpies are great because they require relatively little cash and can be found regularly. They can serve as study pieces to learn to spot the quality differences in a particular field or in collectibles overall, and they can make a great rotating collection with some items getting sold to pay for new purchases. The trick is not paying high prices for Magpie items, even if most of us have done so from time to time as we learn. Acquaintance collectibles are probably where most of us are comfortable. There's a measure of challenge in the search, while prices still tend to be on the lower side, and bargains can be found often enough to keep us happy. There's still likely to be regular turnover in the collection, but we enjoy being around the collection and showing it to friends, even those who don't quite understand our tastes. Engaged or Married collectibles are a significant step up emotionally and often financially. Yes, I once bought a unmarked Durand vase for $40, but those special items are rare enough that we remember them. I can't name any of the bargains I got at the Acquaintance level. Finding items at this level means a bigger time commitment, especially if you still insist (like me) on finding the bargains. There will be fewer successes and still be some mistakes at this level, those that just don't work out as expected and those that got away, but once you learn to appreciate the differences that put items on this level, the pleasure each one gives will be deeper. While I consider aesthetics the most important issue in value, the market doesn't always (almost never) work quite that way. There are also matters of availablity and desirability. Many of the average items are easily available in Germany, Great Britain, Canada, and Australia, even if specific form/glaze/size combinations can still be tricky to find. Availablity has only increased in the last year or so in the US as more dealers begin to stock the items. Even among these dealers, including the higher end, most items available are of average quality since both dealers and collectors remain short on information. Many people make the mistake of thinking that eBay is a clear window into the antiques/collectibles market simply because it's the largest venue, but all venues have distortions. Over a given week, some items (such as Ruscha 313 or Carstens "Ankara") seem to show up in large numbers, but in another week few if any are available. After not seeing an "Ankara" listed for weeks, I bought three or four from different sellers over a 10 day period. Even after following the market for years, it's not clear what the potential availability is on some items or variations. It's fair to say that most Scheurich shapes are rather easily found, but some of the glaze/size combinations can be elusive. For now, collectors need to follow the basic guide that more complex/difficult items are likely to have been made in smaller numbers. It's also likely that items such as the larger plaques by Ruscha have probably suffered more breakage just because they are open to being easily snapped by the wrong leverage (especially when being moved or shipped). To some degree, the desirability is influenced by both aesthetics and availability (or perceived availability), but publicity can have a powerful effect as well, good or bad. This can cause distortions in the market that not only make a given item look "better" but may make items appear "worse" if they don't get equal publicity. That can create small blips with particular lines (see the Roth discussion in the right hand column), or it can cause a stir throughout a company. Some collectors can probably remember what Blenko prices were like in the early 90s compared to the late 90s and a bit onward. I'm WV bred and love Blenko, but I'm not convinced that some of the designs deserved quite that much attention (though some certainly did and do). The West German pottery field is so large that it's dimensions have only been determined in terms of time so far. Even fairly experienced collectors have yet to realize how big the range seems to be, so those about to come into the field can get ready for a real shock, especially the first time you see a large collection in person. That also means there's likely to be numerous waves of publicity that affect the market. There was a "Bodo Mans" wave for his Bay Keramik designs even before most people knew W. German pottery existed. We've been going through the "Fat Lava" wave since the first Fat Lava exhibition and the catalog in 2006. I expect we'll eventually ride waves for most of the different styles, companies and designers. Overall, it should be a long ride, so have fun. 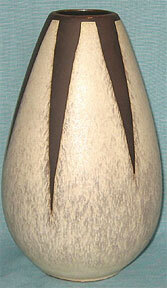 This is one bottom-style of a handmade Ceramano vase. The writing says Turkis (decor name), Ceramano, W. Germany, Handarbeit (which usually indicates hand work in the decor), and the artist's initials. Most of the W. German companies made some exceptionally fine items and some quickies for the tourist trade, but there are some general guidelines for the quality and production numbers you can expect. Keep in mind that the majority of W. German items are not exceptional in terms of design or execution. However, since they are so different from what people are used to, these pieces often appear more striking, especially to collectors who aren't familiar with the full range of quality. That means most W. German pottery items are and will remain under $100 in value with a large number under $50. The items mentioned in this essay are the exceptions, so don't think that every piece of Scheurich is worth $350. Not even every piece of Ceramano reaches such levels. Companies with higher quality control and fairly low production numbers include Ceramano, Otto, Schlossberg, and Silberdistel. However, there are exceptions to note here. Near the end of production, Ceramano did faster work with less hand detailing and simplier glazes. Otto has continued production under Otto Gerharz Jr. and while the work is still good, it's not up to earlier standards and probably available in larger numbers. Before the later, more Pop Art styles started getting attention, the early Bay designs, especially those attributed to Bodo Mans were bringing some of the highest prices in the WGP field. However, relatively few collectors seem equally fond of both the earlier and later works, and prices have fallen for the Mans work. Bay did some intriguing work in the 1960s and early 70s, with several glyph or folkloric patterns. They also did some popular blue glazes easily mistaken for Italian, but Bay didn�t produce the volcanic or fat lava glazes that collectors of later items have focused on. As a result, prices have lagged on later Bay. I suspect their time will come as collectors become more aware of what�s available. Even though the teal is more common than the red or white backgrounds, it still commands a significant price simply because it works so well. An Ankara shape/size 1240-25 sold at a Rago auction for $705 in 2003. Shape 1240 is a ball form that shows the decoration especially well. Although I wouldn�t put the value that high in the typical market as yet, I think it�s a fair indication of where prices are headed as the better pieces are discovered by higher level collectors. While many W. German pottery items include hand work in the decoration, Ceramano is one of the few commercial art pottery companies that made a significant amount of handmade items. The company was designed to work more like a studio with extra emphasis on quality over quantity. Forms weren�t especially experimental, but since of proporiton, design and execution were superior. Glazes varied from the Arts & Crafts-like �Capri� to the striking �Saturn�. They didn�t do as much with volcanic or fat lava glazes as some other companies, but did produce �Rustica� with the geometric pumice glaze over a green background. That line was copied by Silberdistel and D�mler & Breiden, but the Ceramano versions are marked. On the positive side, most Ceramano items are well marked, including the company name, form number, and the decor name. On the problematic side, Ceramano sometimes re-used decor names, assuming that you can read the incised writing to begin with. Much of the early design work was done by Hanns Welling, including �Pergamon�. Welling worked for several companies during the WG era and is likely to become noted as one of the most prolific designers. On average, Ceramano pieces have a higher value based on both aesthetics and availability, but it varies how much of the value is in the form or the glaze. While hand made pieces are likely to be produced in smaller numbers, the difficulty in many of the glazes/decorations will raise values just as much. At this point, collectors have not become fully aware of Ceramano because little was exported, but I expect Ceramano to be one of the best long-term collectibles in the WGP field. ES was a large producer, but very few items were marked, and that has made attributions slow until the last year or so. One of their best designs is the pitcher form originally numbered 683 and later 883. Much of their work is middle of the road, but they did some glazes that are among the very best. In particular, they did some excellent volcanic/fat lava glazes. Despite doing such striking work, Hutschenreuther often gets left out in discussions of W. German pottery. Designs were primarily by Renee Neue and feature very strong colors, often orange and black or green and blue combinations. The variety of forms and glazes is not as broad as with most other W. German companies, but the quality is consistently high and the clay used is of a finer mix, though not the porcelain that Hutschenreuther is best known for. Prices are inconsistent but should eventually move close to the top of the list except among those looking for lava or volcanic glazes, which Hutschereuther never produced. One difficulty is that Hutschenreuther didn�t put form numbers on the items, much less decor names, so discussing or searching for items is problematic. With luck, that will be resolved as catalogs are discovered and more information is published. Marei produced numerous colorful planters, but as more items are properly attributed, it�s becoming clear that they also did some exceptional, often bizarre, glazes. Most of the forms are only average, but a few are good with some very good. 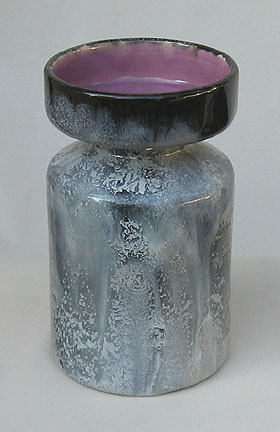 They produced a series of sculptural �see-through� vases that may be the best of the type (numbered in the 2000 series). Glazes are often a wild mix of colors, sometimes textured. Some feature a metallic gleam, especially the purple glaze. In the 8-10� range, good glazes should bring $225 and up. As with much of the WGP, it�s still unclear how many of the smallest sizes were produced. In this case, that means around 4�. Shape 2006 appears to be the hardest to find and may have suffered production difficulties. I suspect the form had a tendency to sag. Most of the forms from Otto were done by Kurt Tsch�rner with a focus on jug shapes. However, there are some shapes with a very strong mid-century feel. Since the forms weren't numbered, it's currently difficult to discuss particular shapes. That's another item waiting for more research and publication. Glazes were developed by Otto Gerharz, and he has to be considered a master. Types range from powerful volcanic glazes to subtle uses of browns or grays and unusual shades of lavender. Many Otto items should rise to the top of the value list, but there will be some problems sorting the early items from those made after Otto Gerharz Jr. took over the company. Later items are sometimes marked with a foil label rather than the earlier "typewriter" label, but some of the same forms stayed in production. There are also some later glazes quite similar to the earlier ones, although in general later versions appear to be less complex. Most Otto items are 8" or under, which is likely to put a higher than usual premium on larger pieces. While I expect the volcanic glazes to get the most attention, collectors with a sharp eye should pay close attention to many of the other glazes. Perhaps the best known Roth decor is the one called "Petals" by collectors (since Roth's line/decor names are still not known, if they had any). 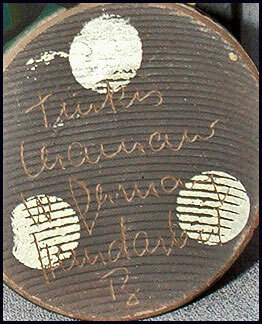 The standard version has a black pumice glaze outlining concave ovals. Prices for this decor took a significant jump after Mark Hill mentioned them specifically on an episode of the British "Roadshow". Naturally, this meant that numbers listed on eBay also jumped. For a while, prices stayed up, but buyers eventually realized that many of these were fairly common. That listing surge probably made them look more common than they really are, but it failed to reveal that there are some uncommon and even rare variations. While I believe these items are worth the higher prices, they are actually only mid-range in quality compared to other W. German items. Ruscha ranks among the best of the W. German pottery companies throughout the era, and the original 313 shape designed by Kurt Tsch�rner and introduced in 1954 should become known as one of the definitive mid-century forms. Not many shapes are worth collecting regardless of decoration, or even without decoration, but this is certainly one such item. Some of the earliest hand-applied decorations, such as Milano and Domino, were created by Cilli W�rsdorfer followed by glazes (Vulkano) created by Otto Gerharz. These were the early focus among collectors, but attention has more recently turned toward the lava and metallic glazes that appeared beginning around 1965, after the 313 form was simplified for ease of production. Value on earlier versions is in form, decoration and likely lower production numbers. 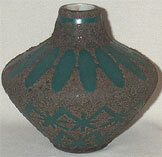 While the later version still has an interesting form, the primary value is in the glaze. Production numbers for the shape were high, but given the enormous variety of glazes used, many glazes are still difficult to find. Some prices for the better early decorations and the most striking late decorations have already reached $350-450 at auction. Most of the best form and decor designers worked for Ruscha either directly or freelance at one time or another, and the company managed to continue production longer than most with some high quality items into the 1980s. That means Ruscha items are generally easy to find, but the better forms and decors will find a strong market as collectors become familiar with production. Alert: The Ruscha name is now owned by Scheurich and used for special items. So far, these items are not easily confused with the better work done by the original company, but it's another case of remembering to buy the item, not the mark. Scheurich quickly became the largest producer of commercial art pottery in the W. German era and is one of the few companies still in business. Scheurich items from the mid 1960s onward are the most widely available, and the quality range is probably wider than any other company as well. Speed seems to have outranked quality control throughout company history. As a result, most Scheurich items, like most W. German pottery overall, will remain in the low to moderate value range. Many will stay in the $25-50 range, and the majority of the items under 10" will stay under $100 (not counting brief "publicity" spikes). Of course, there are exceptions, and with the amount produced, even those exceptions are sometimes numerous. Very few Scheurich items have particularly interesting forms. They are generally fairly basic shapes with slight adjustments, resulting in many very similar shapes but safe in marketing terms. Even here, the quality varies, however, mostly based on the success of the proportions. Shapes 507 and 517, which were used for most of the Scheurich floor vases, are wholly classic forms, but they work because the proportions are pleasing. Shape 271 by Heinz Seiry became a great marketing success using some of the angularity of the period, but the proportions are all very safe whole ratios. The form is pleasant, but any deeper aesthetic influence has to come from the decoration. That factor covers most Scheurich. The value (aesthetic and market) is mostly in the decor/glaze. Exceptions include shape 267 and the Jura line, which has some of the "decor" worked into the mold. Both are farily common as forms, but values will grow because of the form as well as the glaze simply because the design is more effective. Scheurich made many items in the 16-18" range, somewhat fewer in the 20-21" range. As with almost any pottery, there is some additional value in larger pieces, and these are currently the most sought by decorators and those collectors with a lot of space. Still, let's not forget the "size isn't everything" rule. There are some truly boring Scheurich floor vase, especially among later production. The animal/figural decorations are among the most valuable, especially when in conjunction with a volcanic or fat lava glaze. The most common are the horse decors, and there is significant variation in quality in design and execution even there. An average 16-18" horse vase should have a value in the $400-500 range. Better ones can quickly jump to $500-750 with some animal items going much higher. The interest in many of these is justified, and the animal decors are likely to be among those going up soonest and farthest. 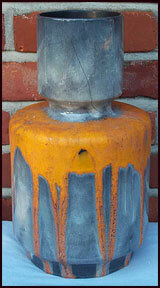 Steuler is one of the few WG companies where form often outweighs glaze in the value. The best known are the Cari Zalloni forms such as Zyklon (Cyclone), Facette, and Continua, but later designs by Heiner Balzaar are also worth noting, even though the designers were quite different. Zalloni�s forms are more angular, closer to an Art Deco geometric influence, often using monochrome glazes. Continua is something of an exception in form, using more curves, but there remain very distinct edges. Balzaar�s work is more organic in design, although more suggestive of water-worn stone than the vine-like Art Nouveau. Glazes are often subtle, natural in tones, but with an underlying complexity. As usual with W. German pottery, there�s another side, and with Steuler that means some very striking glaze work. They did some of the finer lavender and purple shades, and later releases of Zalloni�s forms included some unusual colors. So far, Zalloni�s work, particularly Zyklon, has gotten the most press, and that has resulted in some price spikes, though not consistently higher prices. The red and cobalt versions usually bring higher prices, but yellow is harder to find. The other standard color in the early versions was white, and the blue is often found in blue-on-blue versions.